Digi-Schlock: MST3K VOL. 22 (Shout! Factory 4-DVD Set) – Schlockmania! 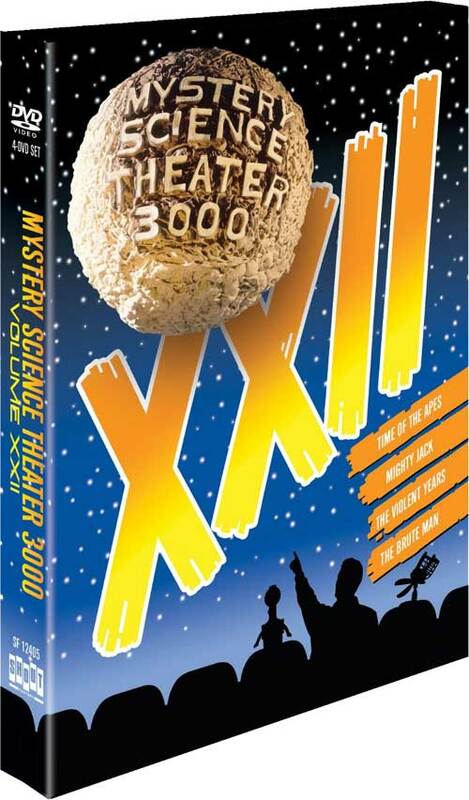 Between their Gamera-themed box set and their 2-disc Manos: The Hands Of Fate set, Shout Factory has done well by Mystery Science Theater 3000 fans this year. As the Christmas season approaches, they’ve dropped one last jumbo set for the year to satiate the MST3K fanbase. MST3K Vol. 22 is another solid entry in this show’s ever-growing list of box sets, offering up a quartet of episodes in nice shape and adding a decent helping of bonus material to sweeten the deal. Transfers are taken from original video elements and look as good as a videotaped show from the pre-HD era can. The same can be said for the audio: you won’t miss a moments of the bad-film riffing because everything sounds nice and clear. If you’ve been getting by with tapes or DVD-R’s of these episodes, this set offers a nice upgrade. There are also plenty of extras to flesh out this set. The Mike-era episodes, Mighty Jack and Time Of The Apes, both feature introductions by Japanese genre specialist August Ragone. Both run less than ten minutes and feature Ragone laying out the production history of the t.v. series these films were taken from in a lighthearted but informative manner. 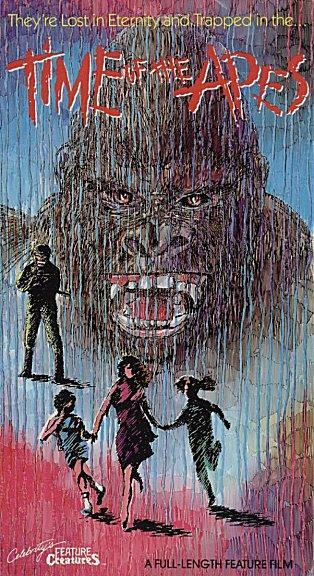 Time Of The Apes is revealed to have been inspired by a highly successful broadcast of Planet Of The Apes on Japanese television. More surprising is the fact that Mighty Jack‘s original t.v. incarnation was a very adult-minded and critically well-regarded television show. The Time Of The Apes disc also includes the wrap segments filmed for its later incarnation as a pair of Mystery Science Theater Hour episodes. As usual, Mike Nelson hams it up under latex as an addlebrained film historian who tends to do goofy things under the end credits. The Mighty Jack disc’s secondary extra is a nice little featurette about how the creative design of the menus on MST3K discs is achieved: fans who enjoy the often hilarious menus will appreciate the insight this segment offers. The other two discs feature more substantial extras. 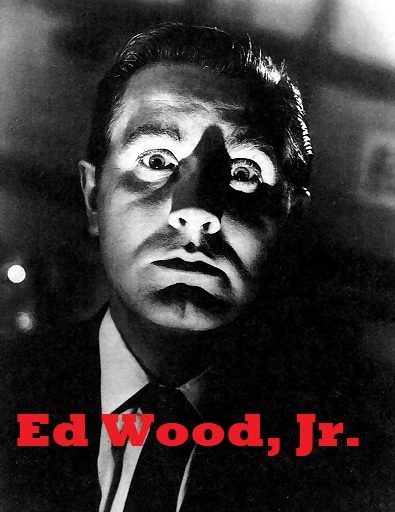 The Violent Years includes lengthy interview segments with two of Ed Wood, Jr.’s lady loves, Dolores Fuller and Kathy Wood. Both were filmed in the mid-1990’s and feature the women responding to a series of questions about their lives with the bad-cinema icon. The interviewing in both segments is a bit awkward (lot of weird pauses before questions) but both women are forthcoming about life with Ed. They talk freely about his transvestism, the struggle to secure funding for his movies and what Wood was like off-camera. Fuller also talks a bit about her career as a songwriter, namely how she ended up writing songs in several Elvis Presley musicals, while Kathy Wood reveals the details of her husband’s lonely death. There’s a certain sadness that informs both interviews, especially Kathy Wood’s. The biggest selection of extras can be found on The Brute Man. Things get rolling with a brief introduction from writer/performer Mary Jo Pehl, who admits that the film was tough to build jokes around and her lack of fondness for it. There’s also a 24-minute documentary originally done for the Sci-Fi Channel about MST3K itself. It dates from the Mike era so there’s no Joel Hodgson or Trace Beaulieu but you get an interesting look into the show’s later years and how they pulled off the show’s retro-chintz look. However, the best extra on the disc – and indeed, the entire set – is “Trail Of The Creeper.” This Daniel Griffith-helmed documentary interviews an array of genre historians (Fred Olen Ray, Ted Newsom, Bob Burns, etc.) 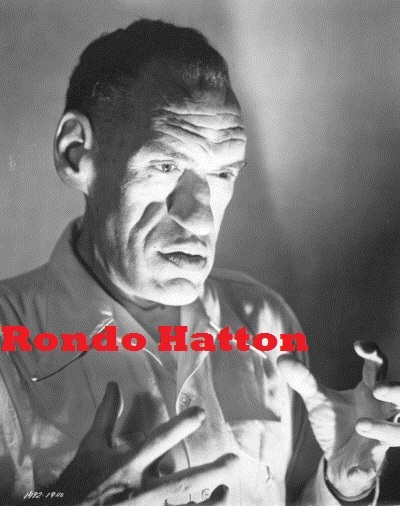 as it lays out the tragic facts of Rondo Hatton’s life, his short career as a horror film star and how his influence has lived on through the work of fans (most notably, the inclusion of a Hatton-style villain in The Rocketeer). It’s a very stylish piece, with artful chapter-style transitions between each segments and even an effective retro-horror musical score. All in all, another fine piece of work from Griffith. Overall, this is another strong MST3K collection from Shout! Factory: the transfers are up to snuff and the bonus features genuinely boost the value for bad-film historians.